Do some cultural sightseeing at Plaka and National Archaeological Museum. Deepen your sense of the past at sights like Acropolis of Athens and Temple of Olympian Zeus. And it doesn't end there: get engrossed in the history at Acropolis Museum, appreciate the history behind Erechtheion, pause for some serene contemplation at Church of Kapnikarea, and see the interesting displays at Museum of Greek Popular Musical Instruments. For traveler tips, ratings, other places to visit, and more tourist information, go to the Athens day trip app . Sao Paulo, Brazil to Athens is an approximately 19.5-hour flight. You can also do a combination of bus and flight. Due to the time zone difference, you'll lose 5 hours traveling from Sao Paulo to Athens. In May, plan for daily highs up to 29°C, and evening lows to 20°C. Wrap up your sightseeing on the 19th (Sun) to allow time to travel to Fira. Head to Mnemossyne Gallery and Eduart Gjopalajfor some retail therapy. Get in touch with nature at Perivolos and Hiking Trail Fira - Oia. There's still lots to do: explore the ancient world of Akrotiri, explore the striking landscape at Skaros Rock, contemplate the long history of Ancient Thera, and learn about winemaking at Santo Winery. To find reviews, photos, traveler tips, and more tourist information, read our Fira vacation planner . Traveling by combination of flight and bus from Athens to Fira takes 3.5 hours. Alternatively, you can do a combination of taxi and ferry; or do a combination of flight, taxi, and ferry. In May in Fira, expect temperatures between 28°C during the day and 20°C at night. Cap off your sightseeing on the 23rd (Thu) early enough to catch the ferry to Rethymnon. Take a break from the city and head to Episkopi Beach and Lake Kournas. 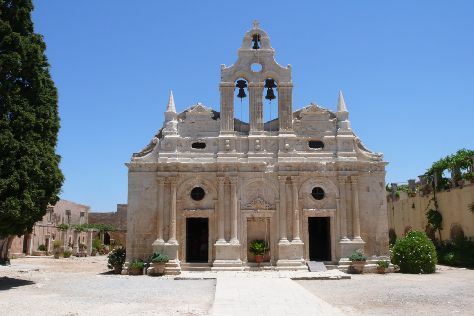 Do some cultural sightseeing at Monastery of Arkadi and St. Nicholas Church. You'll find plenty of places to visit near Rethymnon: Reptisland (in Melidoni), Ilys ceramics (in Margarites) and Small Triopetra Beach (in Triopetra). There's more to do: steep yourself in history at The Venetian Fortezza and contemplate in the serene atmosphere at Monastery of Panagia Chalevi. For traveler tips, where to stay, more things to do, and other tourist information, go to the Rethymnon trip site . You can ride a ferry from Fira to Rethymnon in 2.5 hours. Alternatively, you can drive; or do a combination of ferry and taxi. In May, daily temperatures in Rethymnon can reach 29°C, while at night they dip to 19°C. Wrap up your sightseeing on the 26th (Sun) to allow time to travel to Rhodes Town. Visiting Lindos Beach and Tsambika Beach will get you outdoors. Visit Medieval City and Our Lady of the Castle for their historical value. 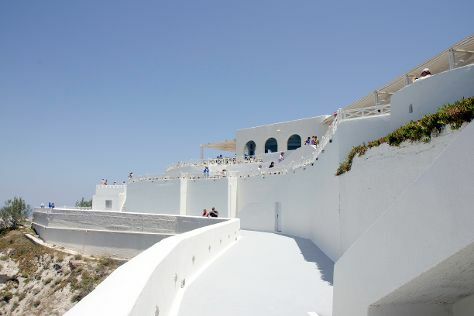 Explore the numerous day-trip ideas around Rhodes Town: Ancient Kamiros (in Kalavarda) and Agios Pavlos Beach (in Lindos). 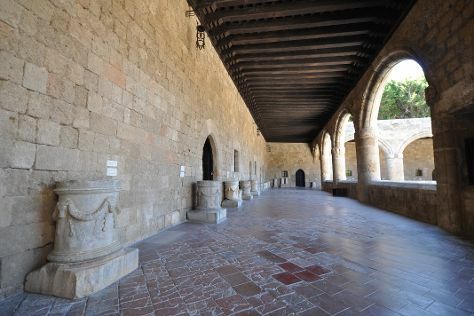 There's more to do: take an in-depth tour of Archaeological Museum of Rhodes (Hospital of the Knights) and take a stroll around Kallithea Springs. To find ratings, more things to do, maps, and more tourist information, use the Rhodes Town itinerary planner. Getting from Rethymnon to Rhodes Town by combination of shuttle and flight takes about 4 hours. Other options: do a combination of car and ferry. In May in Rhodes Town, expect temperatures between 27°C during the day and 20°C at night. Finish your sightseeing early on the 29th (Wed) so you can travel to Berlin. You'll explore the less-touristy side of things at Memorial and Museum Sachsenhausen and Kaiser Wilhelm Memorial Church. Deepen your sense of the past at sights like East Side Gallery and Memorial of the Berlin Wall. 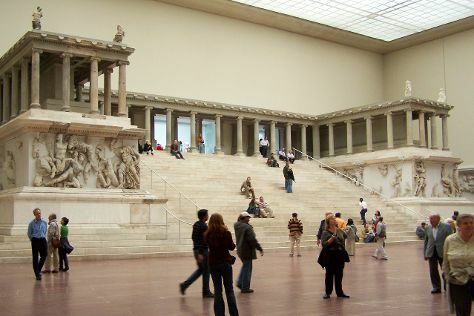 Next up on the itinerary: admire the masterpieces at Pergamonmuseum, examine the collection at Neues Museum, admire the landmark architecture of Reichstag Building, and contemplate the long history of Charlottenburg Palace. To see other places to visit, ratings, and more tourist information, read our Berlin day trip site . Traveling by flight from Rhodes Town to Berlin takes 6.5 hours. Alternatively, you can do a combination of ferry and car; or do a combination of ferry, bus, and train. The time zone difference when traveling from Rhodes Town to Berlin is minus 1 hour. You'll set off for home on the 4th (Tue).